For modern cars, which mostly rely on OBD2 or CAN computer systems, a tune up consists primarily of servicing and/or replacing filters, spark plugs, and other high wear items in the fuel and ignition system. This is usually done as part of the car's regularly scheduled maintenance, which can also include inspections, filter changes, flushes, and replacing timing belts. In contrast, preventative care for older vehicles (primarily those made before the late 1970s and all classic cars) requires a more in-depth tune-up process, such as replacing distributor caps and points, manually adjusting fuel mixtures, and more. No matter the age, make, or model of your car, Budget Muffler Brake & Automotive will ensure you get the right preventative care and scheduled maintenance to maximize your vehicle's performance and lifespan and catch small problems before they turn into major repairs. 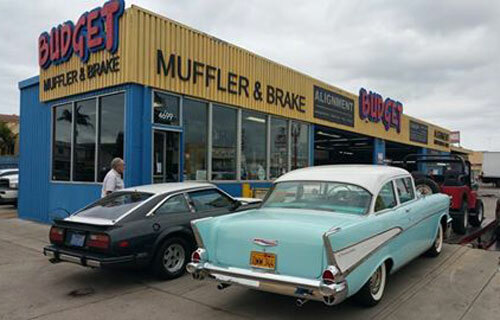 At Budget Muffler Brake & Automotive, we have more than 75 years of experience performing preventative care services on a full range of vehicles, including foreign and domestic vehicles, sports cars, classic cars, and low riders. Our expert scheduled and periodic maintenance services will not only keep your car running smoothly, but also help maintain your car's resale value. We customize each of our maintenance services to our customers' unique needs and will happily provide maintenance recommendations and schedules. Additionally, if you've already noticed a problem with your vehicle, we will accurately assess it and offer you a cost-effective solution. Our highly experienced, ASE-certified technicians stay up-to-date with the industry's leading service techniques, use state-of-the-art diagnostic equipment and tools, and have access to one of the largest inventories of high-quality, brand name parts, ensuring faster service and longer-lasting, reliable results. Walk-in or call Budget Muffler Brake & Automotive today for automotive scheduled maintenance and tune-ups. Our San Diego County customers can trust us to always make preventative care easy, affordable, timely, and convenient. Our hours are 8 am to 5 pm, Monday through Friday, and 8 am to 4 pm on Saturdays. You can come here with confidence knowing that you will get your car taken care of at a good price by friendly staff. That's why this place deserves five stars . . .